Accomplished journalist and acclaimed educator Murray Fromson passed away on June 9 at age 88. He's been remembered by the New York Times, Los Angeles Times, and other organizations. Links to those reports are below. Always interested in the big story, Fromson long wanted to visit and report from China. And he was accustomed to dealing with uncooperative governments. Based in Moscow in 1972, he wanted to interview Russians on their impressions of Nixon’s trip to China. Soviet authorities didn’t permit it. We interviewed Fromson in 2010 as part of our Assignment:China series. Some portions of that interview are included in the China Watching segment. In those clips (at 2:43 and 12:31 in the film), Fromson discussed how most China watchers viewed the country through a Cold War lens and highlighted the importance of Hungarian priest László Ladány (1914-1990) to reporting on China. Fromson always wanted to visit and report from China. Here we share Fromson’s story of how CBS politics kept him from going to China in 1974. Fromson's passion for chasing a story is evident from that story. He never stopped. He was born in New York in 1929 and grew up in Los Angeles, going to work for the Los Angeles Times in 1946. Fromson reported for Stars and Stripes during the Korean War and later for the Associated Press. After six years with NBC, he moved to CBS. His foreign postings included South Korea, Japan, Thailand, Russia, Hong Kong, Bangladesh, Vietnam and Cambodia. Famed for his war reporting (such as American bombing in Laos), he also reported on the discovery of Cambodia’s amazing Angkor Wat in 1956. In the mid-1960s he was back in the United States, reporting on the civil rights struggle. In 1969-1970 he was concerned about U.S. government hostility towards journalists reporting on the anti-war movement, the Black Panthers, and the Weatherman. He and others organized the Reporters Committee for the Freedom of the Press. Murray Fromson asking a question at our 2007 conference on "The Future of U.S.-China Relations" and talking with keynote speaker Amb. Stapleton Roy. Fromson and Roy had known each other for decades. 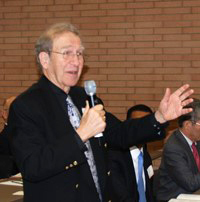 After thirty-five years as a print and broadcast journalist, Fromson became a professor at the USC Annenberg School in 1982. He taught here for a quarter century and served as the director of the journalism program from 1994 to 1999. When he retired in 2006, the School organized a celebration of his remarkable career. That event included testimonials from many of his colleagues, clips from his reporting and concluded with an interview with Fromson. He later sat for an extended interview for the USC Living History series. Fromson remained interested in China, visiting and writing about it. For example, in 2001 he wrote about Taiwanese investment on the mainland. We were honored to have Murray Fromson as a supporter. He and his wife Dodi attended many of our events, including our first major conference in 2007 where he rekindled his acquaintance with our keynote speaker, Ambassador Stapleton Roy. We extend our deepest sympathies to Dodi, his children Aliza Ben Tal and Derek, and to all those Fromson touched in thirty-five years of reporting and twenty-five years of teaching, and another five years blogging for the Huffington Post.